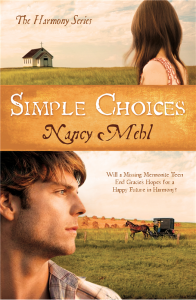 Set your GPS for the small town of Harmony, Kansas, where a city girl becomes embroiled in mystery and romance. Graphic designer Gracie Temple is engaged to Sam Goodrich. As she returns from chaperoning her protégé, Hannah Mueller, during summer art classes in the city, Gracie is eager to finish her wedding plans and marry the man of her dreams. But unexpected events threaten to disrupt the peaceful lives of those in Harmony—and Gracie’s wedding. Hannah goes missing, and Gracie’s happy plans become a mess of suspicion and fear. Will Gracie ever find contentment and marital bliss in Harmony?